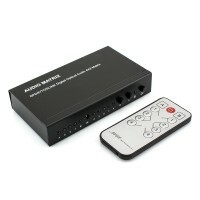 An Optical (Toslink) Switch provides a simple and effective solution to allow connection of multiple source devices to a single input on an audio system. Each switch is supplied with a remote control to allow convenient selection of the desired source device. 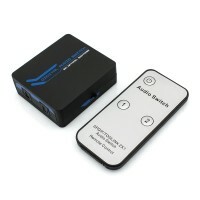 If you need more digital audio inputs, this 2 Port Optical (Toslink) Switch will instantly convert 1 socket into 2. This device acts like a double adaptor with the added ability to select inputs. Can be powered via USB or mains power (with an optional USB power supply adaptor). This 3 Port Optical (Toslink) Switch will facilitate seamless switching between 3 source devices, transmitting high quality digital audio (S/PDIF) to a single input on an audio system. Can be powered via USB or mains power (with an optional USB power supply adaptor). This superb device offers the ultimate digital audio (S/PDIF) distribution solution. With 4 inputs which can be selected in any combination for each of the 2 outputs, this 4x2 Optical (Toslink) Matrix Switch provides incredible versatility and supreme control.